There are many resorts in the area each with its own flavour but they all share one very important factor, the famous Hautes Alps climate. Skiing in the sunshine under a perfect blue sky is the ways to go- so don’t forget to pack the sun screen and sun glasses! Puy Saint Vincent is a smaller resort with 67 km of runs. It is however a great little resort and particularly good for families as it is the right scale to give everyone what they want and allow the family to split up and reunite easily as the runs feed back to one centre. There are good easy slopes for beginners; the ‘baby’ at 1400 is a particularly gentle tow with easy runs on either side all in sun shine till late in the afternoon. There are fine intermediate runs and a snow park and boarder cross. The strong point of Puy for advanced skiers is the good snow which is well protected from the prevailing northerly winds and the excellent tree skiing. There are some fine off-piste runs in good snow conditions, notably Bois de Coqs, Narreyoux and the col du Bal, contact the ski schools or local guide Murray Hamilton +33(0)492230856 or murray@murrayhamilton.comor Marc Reynaud through the esf (ecole de ski francais), www.esf-psv.com .The ecole de ski international +33(0)492233079 will provide English speaking lessons with smaller groups than the esf . Lift prices, piste maps and a web cam are available on the sitewww.puysaintvincent.com , this is only in French but is fairly easy to navigate; adult prices are 22.5 euros per day or 129 euros for the week. This is a Galaxy pass which gives you a days skiing in another resort e.g. Serre Chevalier if you wish. Montgenèvre is the resort on the boarder with Italy and is only 12 kilometres from Briancon. It has 100 km of pistes with lots of wide slopes perfect for intermediate skiers. There are some good harder pistes but if you are really looking for a challenge you can take the ‘Via Lactée’ or Milky Way, a way marked route that allows you to ski to Sestrière taking in many of the sites for the 2006 Turin Winter Olympics. Montgenevre is also a station in the Galaxy scheme. Risoul and Vars are the stations of the Foret Blanche and are only half an hour’s drive from L’Argentière. Between them they offer 180 km of pistes with everything from easy tree lined runs back to the centre of the village to the powder of the back bowl between the resorts. The resort also has a snow park, a special surfer’s area called surf land and several half pipes. Pelvoux is a small station with just 12 runs just up the valley from Vallouise; you can actually ski back down the cross country pistes to the village. It is a quieter, more family orientated resort than the larger stations and the choice of many locals to teach their children to ski. The slopes tend to be sunnier than Puy, and a day pass is only two thirds of the price. The lifts give access to some fine off piste runs. Early March sees an open race here the Challenge Nicholas Bourgat, which is rounded of by a meal of local delicacies. The Queyras, the village stations of the Queyras are all smaller and offer family friendly ski experience. They often have excellent snow and give access to areas away from lifts and are the starting points for lots of ski randonées and tours. The tickets are grouped together, so if you wish you can easily ski several stations in one day and combine some sightseeing, as many of the old villages particularly St Veran, the highest village in Europe, retain many of their original buildings and are truly picturesque. see www.queyras.com In terms of après ski the Queyras also offers unique possibilities including diving under the ice of the Lac Saint Anne at Ceillac and skijoring- basically a horse powered ski tow! There are hundreds and hundreds of kilometres of groomed trails in the Hautes Alpes, cross country skiers vary from the really fit racers in lycra suits who skate past you apparently effortlessly to others in woolly hats and jumpers just going for a walk in the snow. It’s a great way to get fit but equally it’s a great way to experience some truly magnificent scenery quietly and away from the crowds. All the stations offer their own cross country ski fields, but for cross country I prefer to get away from the stations and visit some of the other valleys such as the Onde from Vallouise, which often has marvellous feathers of hoar frost on the trees; or the Clarée valley which has kilometres of pistes, you can ski from Val de Près to Nevache and even further if you are feeling adventurous. The Queyras has 200km of pistes through its picturesque scenery, where you often feel you have just skied on to the January page of a glossy calendar. Ski hire is cheap, and so are the passes, redevance. For a first attempt stick to classic, a walking like motion on scaled skis, but if you skate (in-line or ice) try skating with shorter skis and a more rigid boot. A lesson or so should help you pick up the action more quickly. The runs are graded with the down hill colour scheme, do start on easy runs, it’s not the going up hill on skinny skis that’s the problem it’s the coming down! Still you can always take of the skis and walk down the steeper stuff to start with. Take it gently though and you start to trust your snow plough and realise that you can let the skis run. All the exercise is of course a good excuse to stop and sample the local cuisine, there is an excellent bakery in Nevache; try the honey and walnut tarts, or the raspberry flans. After a run in Vallouise you could always sample the wears of the Alphand micro brewery before you wend your way home on foot to your apartment. For those wishing to leave the marked piste there are numerous off-piste possibilities, the ski-schools offer regular guided excursions or contact Murray Hamilton (a local Scottish guide! )www.propeller.net/murray/ on +33(0)492230856 or hamilton.nash@wanadoo.fr . Further ideas are included in http://.ice-fall.com . 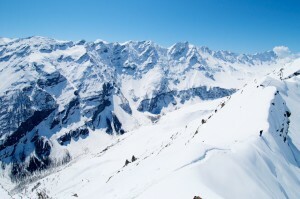 There are a number of guides giving itineraries for ski touring in the area. These are in French, but normally relatively easy to understand. These include 50 Randonnees a Ski autour de Briancon by Rene Kehres and Ski de Randonnee Hautes-Alpes by Emmanuel |Cabau and Herve Gelley which has some 140 routes. Snow kiting has to be practiced above the tree line and away fro m electricity lines! A popular place in the area for the skilled kiters is the Cod du Lauteret as it often generates its own thermals even if there is not much wind around. This site is best in the North West , South and Easterly winds. It does not work well in a North wind. For advice on wind conditions do visitwww.windguru.cz .